I placed this rug in a low traffic room and do love it. The nature of it lends to shedding, but the fibers are long and don't create tumbleweeds through the house. The shedding sticks more so on top of the rug. I think the shedding would be more pronounced if it were in a high traffic area. It's soft and the colors are true to screen...chocolate brown and natural tone. Great price! 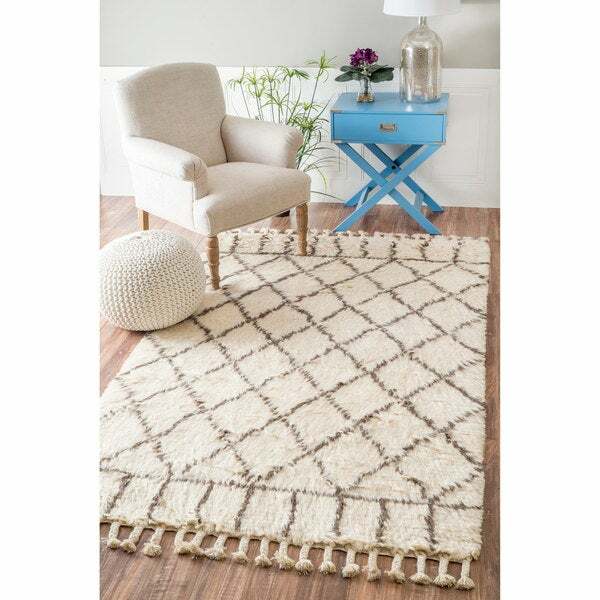 This Moroccan inspired trellis shag rug is made of 100-percent wool. This full and plush area rug was meticulously hand-crafted to create softness under foot. "Hi, What type of vacuum should you use on this rug, and does it shed on your clothes when you sit on it?" Hello bbcubed3, there is not a specific vacuum to use with this rug and we never had any issues with shedding on people clothes. Please let us know if you have any further questions.